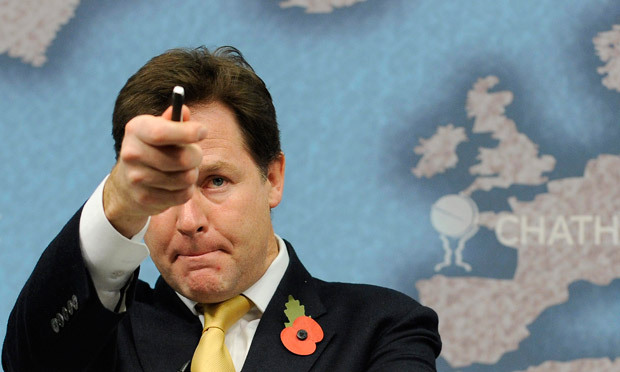 Nick Clegg this morning fell into the usual ‘all or nothing’ fallacy on Europe. He said: ‘As soon as we start talking about repatriation, we descend into the in-versus-out debate.’ But the Deputy Prime Minister is wrong: the in/out debate is already underway, and rather than seek to defend the unpopular status quo, Nick Clegg should back renegotiation as the best option for those who wish to put the UK’s membership on a stable democratic footing. But instead of attempting to address the causes for the EU’s unpopularity, the inflated budget, democracy deficit and bureaucracy etc. Nick Clegg sought to channel the debate into his own in/out debate where the problems of ‘out’ justify doing nothing about the problems of ‘in’. Clegg said that UK can either be a full member of the EU or outside, like Norway and Switzerland. He is right that Norway as a member of the EEA does indeed implement a large proportion of EU law over which it has little influence and that Switzerland does not have full access for its services industries. He also pointed out that with no EU deal ‘firms who currently pay no import tariffs on the goods they send to the continent would be faced with taxes of up to 22 per cent’. It is actually more like 10 per cent but the point is the same. However, protesting that no one is suggesting joining the EEA or not having a free trade deal with the EU is missing the point. Nick Clegg is presenting a false choice. There is not one standard EU membership. The UK is not in the Schengen travel area, others are. The UK has a different deal on EU crime and police law than Denmark, which is fully opted out. There are neutral states and those involved in EU defence, there is the euro, the list goes on. But for Clegg there are only two types. This is an odd justification for the EU’s Common Agricultural Policy, Common Fisheries Policy, social and employment regulation, wasteful regional policy and unnecessary loss of democratic control. Are these accepted as some bizarre self-imposed flagellation for daring to desire free trade? If so, why not just accept a rise in the EU budget and get on with it? It’s the ‘subscription’ fee after all. So what should the UK aim for? In a recent paper we set out that for now the UK benefits from being in the EU’s customs union and single market for good and services but that all other areas should be decided on a case by case basis. Is this pick -and-mix EU possible? Yes. The EU, as Clegg acknowledges, is changing. The eurozone is renegotiating its membership terms, and the treaties will need to be revisited sooner or later. This will present the UK with the opportunity to reform its membership terms and put it on a stable democratic foundation in line with public opinion. The EU club does, but only for the members who are not netto contributers ! What kind of club expects a few well-off members to pay the bar bill and perks of the majority? If you really want to live in a United States of Europe then you could always move to another part of Europe where that's what the people want, but it's not what the British people want for Britain. The benefits of EU membership are insufficient. Better for the UK to separate itself from this corrupt, bureaucratic, and undemocratic organization and seek better trading partners elsewhere. Where, you might ask? How about the Commonwealth nations, the US, Japan..in other words, the rest of the world. If you want your country to be subject to an unremitting, unlimited and very largely uncontrollable process of "ever closer union" with your European neighbours, until eventually your country will cease to exist as an independent sovereign state in any meaningful sense, then that's what the present EU treaties prescribe for EU member states and so you should want your country to be in the EU under its present treaties. If you don't want that, then you should not be in the EU under its present treaties even with special temporary derogations and opt-outs to slow down the process of your legal subjugation for a few years or at most a few decades. To make a solemn commitment to the process of "ever closer union" within the EU but then try to prevent it happening to your country is just dishonest and disrespectful to the peoples in other countries. That's why the UK government should ask the British people directly in a national referendum whether they want to continue with that process, or they've already had enough (or more than enough) "ever closer union" with other European countries and want to call a halt to the process. A permanent halt, not just a period during which it's suspended or slowed down. What worries me about this article is that the eurozone is engaged on a wanton act of self-destruction. They refuse to face the fact that all their economic woes are caused - as they were warned - by the euro's whole design and impossibility of making it work -ever. They, being still wedded to it, will either go bust or will endure a further 5-10 years of stagnation and austerity. They are wrecking world trade in the process. Therefore we ought to be actively bending all our energies for the cold but refreshing world outside. It's a pity that Open Europe can't see this too and help. Clegg has to get used that the communis opinio in the UK has recently changed from EUdoubtful to very EU sceptic. -In with a complete reneg. Labour made a cleverder move, being a Europhile is not going to win you elections (with alot of bad EU/Euro PR coming on a regular basis). Agree that the EU is bad news you should try to avoid putting/having to put money in it, but you donot have to make huge investments to get back to a 'Common Market' like structure. The pros of the EU are simply nearly totally in the common market. The other issues an extra layer of government and the Euro simply cost overall money. The EU could do without Britains negative attitude. Although the EU would be better with Britain in with Britains long standing attitude it might be in the best interest of everyone if the UK just pissed off. On another note, agreed that the only way for EU member states to compete with the US and emerging Asian countries is to unite together under one banner. Well, Karsten, that's just your "very own perspective and private opinon", as you say on your blog. I don't know quite where social democrats like you would fit into the new Europe as reorganised according to the wishes of an expansionist German political elite: last time, many of them ended up in concentration camps, but maybe you'd be luckier this time. I am reminded of a Norwegian called Quisling during the war. He wanted to cede Norway to Germany. These Euroaddicts want to do the same to us vis-à-vis the EU: maybe not just Germany, but the whole wrotten, corrupt crew in Brussels.